The statistics are staggering. In Sacramento County, hunger affects more than 245,000 households, including 88,000 children. Everyday more than 50,000 people struggle to find their next meal. These numbers hold true throughout the region. “I had a heart attack and lost my job. Having diabetes, you have to be on a pretty strict diet. I can’t afford the food I need. I don’t qualify for food stamps and carbs are what are cheap. You know, the churches can only give so much, and they give to the families that have kids, not to the husband and wife that don’t have kids.” – LaVone O’Leary, recorded at Capital Public Radio’s Hidden Hunger: Storybooth. This story and other personal testimonies of residents coping with hunger in the Sacramento region were shared at the Hunger in the Farm-to-Fork Capital events on May 13 and June 3, 2015, hosted by the Village Square and Capital Public Radio. 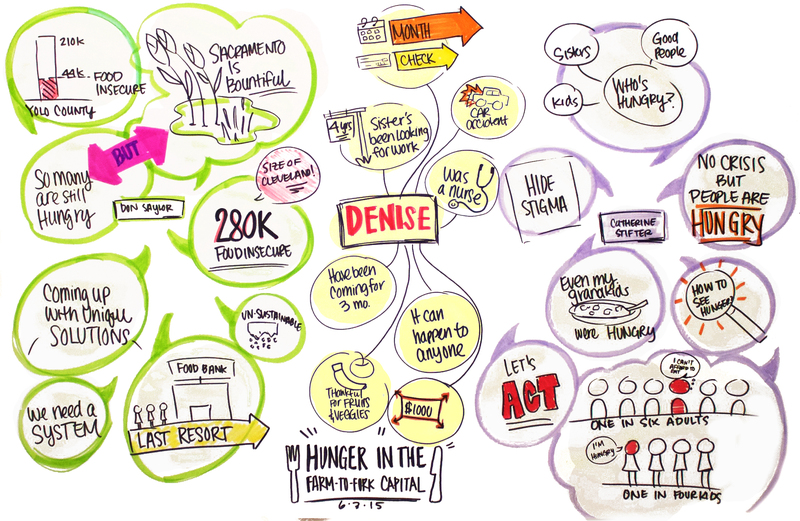 Participants – including people directly impacted by hunger, advocates, policymakers, business people and community leaders – gathered to deepen their understanding of the causes and impacts of hunger, hear new perspectives, and be inspired to take action. What is the value in this type of community conversation? If there’s a problem that needs to be solved, do you get involved? When you hear staggering statistics that seem like they belong more to a country ravaged by war than your own community, what do you do about it? When your neighbors stop talking about important issues that affect your community, where do you turn? We must be willing to take action. To turn people on to action, we need to feel a connection to the issue, to each other and to our community. 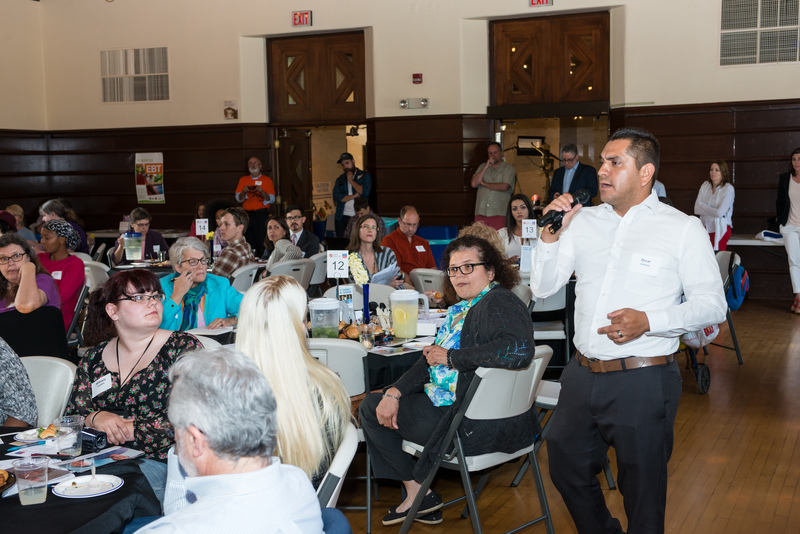 Dialogue and understanding are essential first steps to any long-term solution and one of the shared values of the Village Square and Capital Public Radio’s Community Engagement efforts. 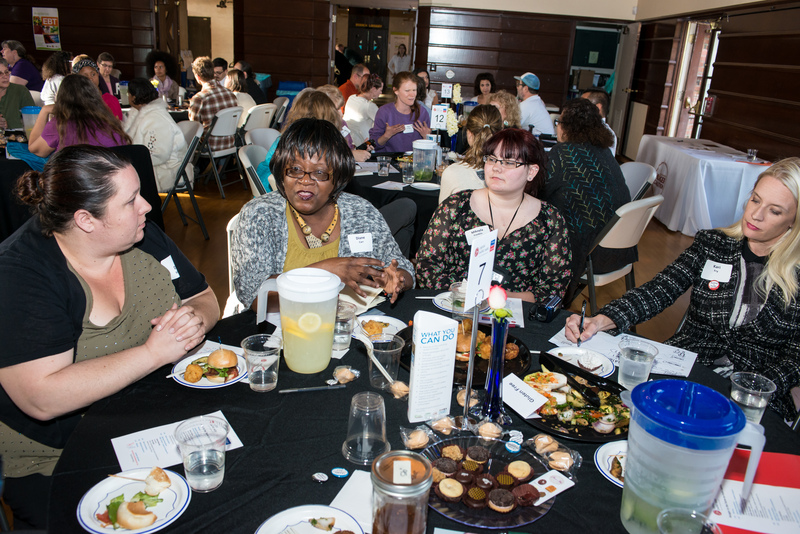 Through the Hunger in the Farm-to-Fork Capital conversation series, Village Square and Capital Public Radio created a welcoming space and the opportunity for honest conversation about the tough topic of hunger. We discovered there is a strong desire for this type of community conversation (both events sold out). We also found that residents are eager to deepen their understanding about the causes and impacts of important topics like hunger, and to hear new perspectives and consider solutions that include mobilizing for action. 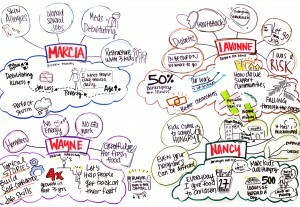 These were not your average community conversations; it was civic storytelling at its best. This was thoughtful content, open-mindedness, diverse viewpoints and powerful real life stories, many that were told by those experiencing hunger themselves and recorded at Capital Public Radio’s Hidden Hunger: Storybooth. This is just what Village Square and Capital Public Radio’s Community Engagement efforts are uniquely positioned to do. We were thrilled to hear that attendees gained a sense of community in a whole new way. That people felt more informed, with a deeper personal understanding, and inspired by what transpired. What we saw was participants building relationships and getting motivated to engage in true community problem solving—exactly what these community conversations are designed to do. We hope you will join us next time! Click here for the May 13 and June 3, 2015 event flyer. 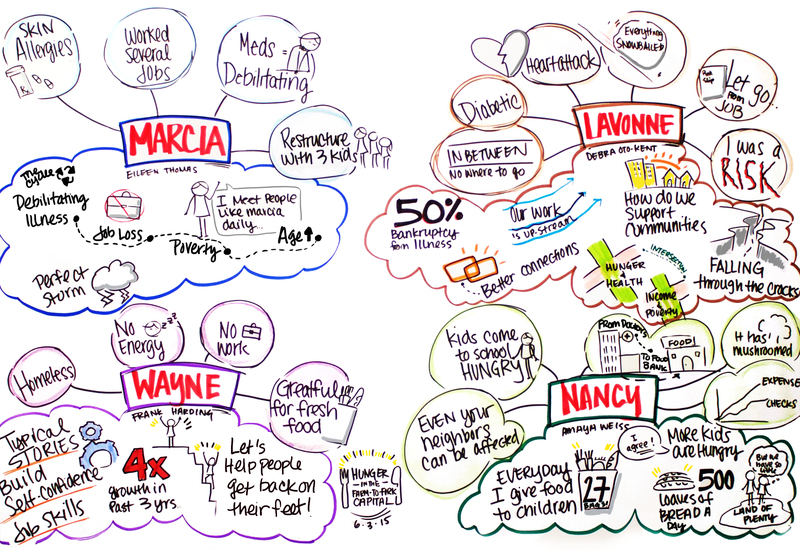 Graphic Recordings of Lightning Talks at June 3, 2015 event. (TALLAHASSEE, FL) – October 8, 2013 – Imagine there is a giant asteroid heading to earth, expected to destroy life as we know it. We’d stop the incessant partisan bickering and do everything within our power to deflect the asteroid, right? Like in the movies? During its 2013-14 Dinner at the Square season, The Village Square examines six American “asteroids” headed directly at us – each a problem that will only grow bigger and harder to “deflect” the longer we ignore it. Stuck inside our feuding partisan tribes, we’ve failed to find common cause against common threats – preferring instead to argue in the public debate about whose asteroid is real; all while the threats continue to build. This year’s season of programming – which will also include a look at “asteroids” Florida must deal with – is a joint project of The Village Square and Dr. Jonathan Haidt of NYU’s Stern School of Business and author of “The Righteous Mind: Why Good People are Divided by Politics and Religion.” The Village Square’s unique model of civic engagement continues to draw national attention, recently named by Senator Olympia Snowe as one of eight organizations in America seeking to grow political common ground (the only one hometown-based). The first program of the season – “American Dream Lost?” – will be held on Tuesday, October 15, 5:30 to 7:30 pm at St. John’s Episcopal Church downtown. This discussion will take on the liberal “asteroid” of rising economic inequality and the conservative “asteroid” of breakdown of the family – both data-supported problems that are threatening to damage the fabric of American society. In a time of unparalleled creation of wealth, the spoils of the American dream are increasingly going to the top 1%. At the same time, the family has taken a hit – with 40% of births now occurring outside of marriage. These two trends are highly correlated and worth joint effort. Panelists include Kay Hymowitz of New York City’s Manhattan Institute and author of “Marriage and Caste in America,” and Dr. Kathryn Tillman of the FSU Center for Demography and Population Health. Tallahassee City Commissioner Andrew Gillum and Richard Albertson of Live the Life, a faith-based organization devoted to strengthening marriages and families, will also join the conversation. In association with this program, The Village Square and the United Way of the Big Bend are partnering to host “A Virtual Experience of Life on the Edge” on Tuesday, October 22, 5:30 to 7:30 pm at St. John’s Episcopal Church. 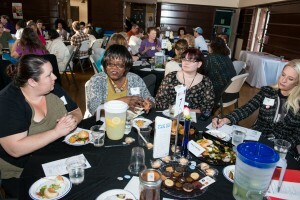 This event is a unique, interactive activity that allows people to experience the day-to-day realities of those living in poverty and provides an opportunity for us to discuss how our community can work together to address the problem. Pre-register for this free event online at www.uwbb.org. “The Asteroids Club” season will continue through the school year with other asteroids, including entitlement spending, climate change, money in politics and moral behavior. Season tickets are available through October 15. For more information, visit www.tothevillagesquare.org, call 590-6646 or email info@tothevillagesquare.org. A limited number of scholarship tickets is available. To learn more about the Asteroids Club project go to www.asteroidsclub.org. Getting ready for our next big Dinner at the Square program, we’re betting many of you are feeling a new and deeper level of regret that you missed the last one? If so, this is your lucky day. We are deeply appreciative to WFSU and FSU’s Center for the Advancement of Human Rights for videotaping our September 13th forum. Barry Richard’s keynote presentation “Security, Pseudo-patriotism and the Erosion of American Liberties” is an absolute must-see! Grab some munchies, kick your feet up and find the two part video online HERE. Stay tuned in coming days for video from other recent FSU CAHR programming. Support the good work done by WFSU in this community by making a donation online HERE.